NOAA returned the GOES 13 weather satellite to service Monday after investigators found a micrometeoroid likely struck the spacecraft in late May, putting the satellite into standby mode for three weeks. Engineers studied the problem in a "fault tree" analysis, eliminating other possible causes until officials conclude a tiny fragment of rock was the most likely cause of GOES 13's problem. "Boeing analyzed a number of possible items that could have caused a sudden disturbance of the spacecraft similar to what we saw, including mechanical issues like a spring suddenly releasing, or a leak of a gas or propellant under pressure," said John Leslie, a NOAA spokesperson. After a thorough analysis, the engineers reported a micrometeoroid or space debris likely hit the arm connecting GOES 13's power-generating solar array to the spacecraft bus, according to Leslie. "Once again, NOAA has three healthy geostationary satellites ready and able to track hurricanes, severe storms, floods and other dangerous weather conditions," said Mary Kicza, assistant administrator for NOAA's satellite and information service. GOES 13 was put in standby mode May 22 when the satellite suddenly lost its ability to hold its orientation in space. Officials initially suspected trouble with GOES 13's star tracker, which determines the craft's orientation in space by monitoring the positions of stars. NOAA activated GOES 14, a backup satellite, to take over GOES 13's duties observing weather over the eastern United States, Gulf of Mexico, and the Atlantic Ocean. 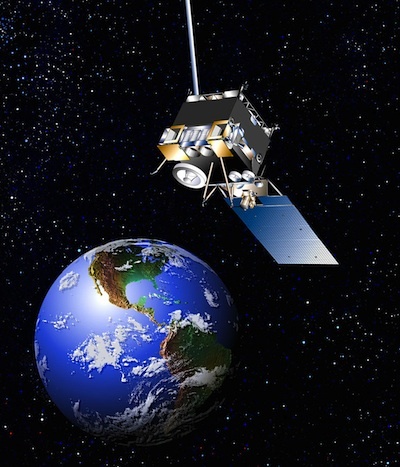 NOAA uses two operational satellites to cover the "GOES West" and "GOES East" sectors of the Western hemisphere. The satellites are parked in geostationary orbit 22,300 miles above the equator. GOES 13 is in the GOES East position, another satellite is responsible for the GOES West coverage area, and a backup craft is stationed in between the two active satellites to take over in the event of a problem. "Our established backup plan worked," Kicza said in a statement. "NOAA forecasters continued receiving valuable satellite images and data necessary to issue life-saving warnings for tornadoes and floods."